Haven Ministries Resource Center at St. Paul’s Episcopal Church at 301 S. Liberty Street in Centreville, MD, was established to offer a place of referral and case management services to residents of Queen Anne’s County who need information on financial counseling, job training, and wellness, as well as limited pastoral counseling and enrichment classes. Haven Ministries’ classes were originally offered to its shelter guests as a way to engage them as they transitioned to more permanent housing and employment – providing encouragement and information to assist them in their journey. As the Resource Center grew, the classes became available to anyone in need of resources to help them with their lives. According to Jessica McCarthy, Case Manager for Haven Ministries, the classes benefit people of all ages. The job readiness workshops focus on resume building, job searching, and interview skills. There are even classes to teach people about healthy relationships, healthy boundaries, and visioning their future. In addition to empowerment workshops, the Resource Center also offers classes in cooking and therapeutic art projects, as well as prayer lunches. For further information on the Haven Ministries Resource Center or a list of available classes, contact Krista Pettit at 410-739-4363. 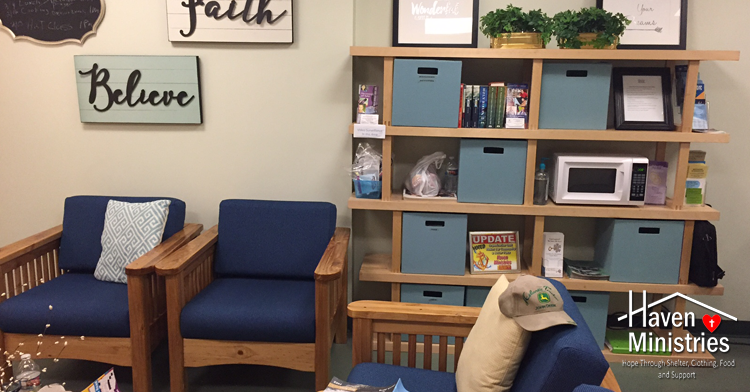 Caption: Pictured is the workshop space at Haven Ministries Resource Center at St. Paul’s Episcopal Church at 301 S. Liberty Street in Centreville, MD. The Center offers classes and workshops for the general public on everything from budget and financial workshops to empowerment workshops for recovering addicts.